Use that degree to get a good job (with health insurance) that pays enough money to cover your basic needs and allows you to build some savings. With your savings, a mortgage loan, and maybe a little help from your parents, buy a home (presuming it makes sense vs. renting). This will save money on rent and home equity will be a major portion of your nest egg. Take advantage of institutionalized savings mechanisms (401K or other pension plans) to start saving for retirement to supplement Social Security. With diminishing payouts and concerns about the future solvency of Social Security, supplemental savings are increasingly important. After many years of work, retire and live comfortably off of your savings and Social Security. While the notion of a strict linear model of the life course is increasingly outdated, there are also questions about the veracity of its basic assumptions–is a college degree worth the price tag? Is homeownership really a good investment? Yet, in the absence of clear alternatives, this remains the dominant life course narrative. Taking advantage of the online analysis tools at the University of California, Berkeley’s Survey Documentation and Analysis (SDA) program, I used the triennial Survey of Consumer Finance (SCF) and annual Current Population Survey (CPS) data to examine trends in work, benefits, and wealth among young working-age adults, those aged 25 to 44, over the past twenty years, with an eye to examining each step in this traditional narrative. The CPS shows a slow and steady uptick in the proportion of young working-age adults with a college degree (or more). The solid blue line on the graph shows the proportion of 25 to 44 year olds with a bachelor’s degree or more. In 1989, just over one quarter of working-age adults had a college degree; by 2010 one third did. 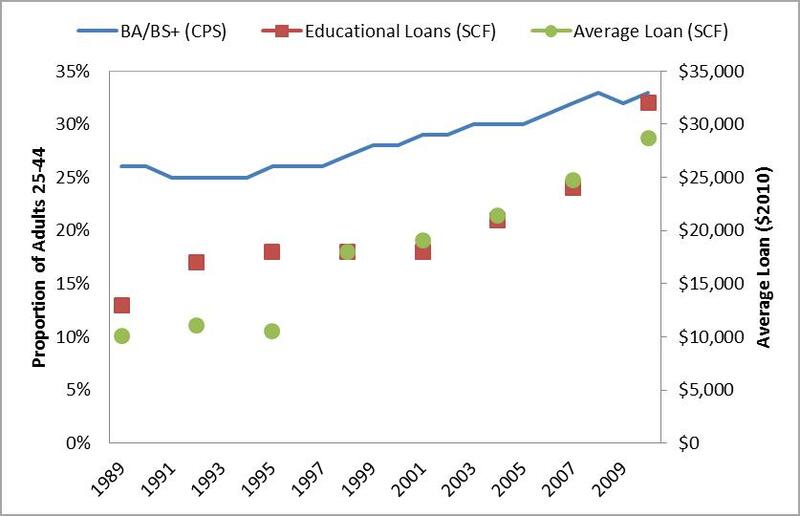 The cost of a college degree rose substantially over this time period, and the SCF data show a dramatic increase between 1989 and 2010 in both the proportion of college graduates with educational loans and the amount of those loans. The red squares on the graph show that the proportion of 25 to 44-year-old college graduates with school loans increased from 13% in 1989 to 32% in 2010. At the same time, the average loan value (the green circles) tripled over the past two decades, from $10,000 to $28,700. While averages can be misleading, the median loan value also tripled over this time period, from $5,300 to $14,800. These trends raise critical questions, such as: What impact does burgeoning college loan debt have on long-term financial security? Do the costs (and loans) suggest rethinking college as a wise investment? Before getting a good job, one must actually obtain a job. Going to school has not been a guarantee of an income, but it certainly has helped.While unemployment levels have remained high since 2008, they are highest among those with less education. Fourteen percent of 25 to 44-year-olds with a HS diploma or less are currently unemployed compared to 9% with some college and 4% with a bachelor’s degree or higher. There are numerous indicators of a “good job”–such as higher wages, fringe benefits, and job stability–and they are all consistently correlated with educational attainment. The chart below shows average annual income from wages and salary by educational attainment among full-time (30+ hours per week) workers ages 25 to 44. Average wages for individuals without a high school diploma dropped substantially in the early 1990s and never recovered, while wages for both those with a HS diploma and some college attendance had moderate fluctuations within a fairly stable range over this time period. In contrast, average wages for those with a bachelor’s degree or more rose steadily during the 1990s and peaked in the early 2000s. 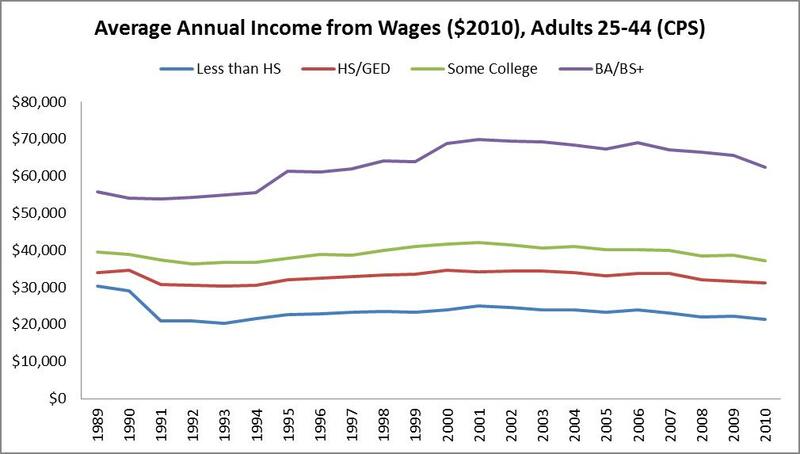 Like all other educational groups, average wages have declined for college graduates since 2007. Unlike other groups, average wages for college graduates remained substantially higher in 2010 than they were in 1989; 2010 wages for all other educational groups were lower than their 1989 averages. Indicators of job and income stability are also correlated with educational attainment. Individuals without a college degree had, on average, 3 more weeks of unemployment in 2010 than those with a college diploma. The 2010 SCF data show a sharp uptick in households reporting a discrepancy between their current income and their typical income. While the average household reported income losses, individuals without a HS diploma reported average relative losses of nearly twice the magnitude of individuals with a college degree or more (-11% vs. -6%). Employed individuals with a college degree are also more likely to have access to fringe benefits that help protect future income streams. The 2011 CPS data show that 83% of employed 25 to 44-year-olds with a college degree have a job with health insurance benefits compared to 70% of those with some college, 59% of those with a HS diploma or GED, and only 30% of those without a HS diploma or equivalent. Lower income and more volatile income streams typically make it more difficult to accumulate savings. SCF data show that, in all survey years (1992-2010), households headed by an individual with less than a college degree were substantially less likely to save than those headed by an individual with a college degree or more. They are also less likely to have any money in transaction accounts such as a checking or savings account; among those with these accounts, higher educational attainment is associated with substantially greater savings. 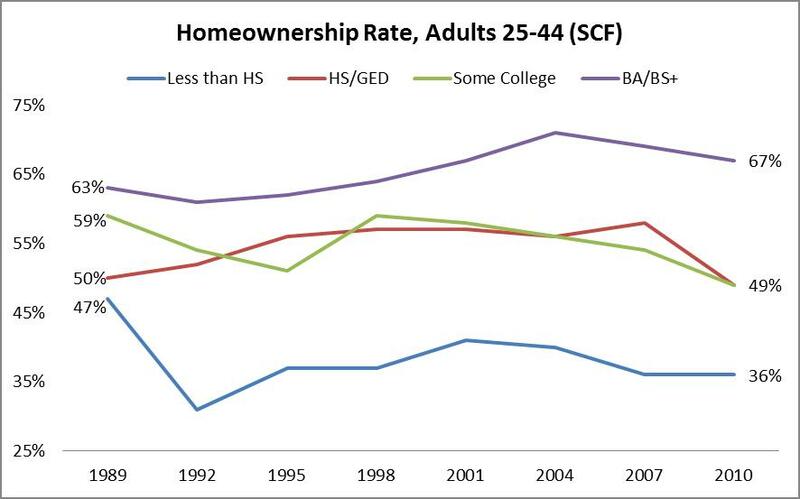 Home ownership rates rose from 1992 through 2007 and declined in 2010 for all educational categories. This decline reflects a variety of factors: reticence about buying post-housing bubble; difficulty getting credit in a tightened mortgage lending market; and loss of homes due to walking away or foreclosure. Among those who own their homes, there was a general increase between 1989 and 2010 in the average ratio of the amount owed to home value. Initially, this may have been because people were able to take advantage of lending programs that facilitated home purchases with minimal down payments. Later, it was because mortgages stayed the same and people’s homes lost value. In 2010, 16.4% of homeowners were underwater on their mortgages, meaning they owed more than their home was worth. These patterns showed little variation by educational attainment; individuals with a college degree were just as likely to be underwater in their homes as those with a HS diploma or less. Access to employer pension plans has declined slightly since 1989. Over that time period, large gaps in pension access emerged. Among 25 to 44-year-olds with less than a HS diploma, 1 in 6 have access to any type of pension plan. This rises to 1 in 2 among those with a HS diploma and increases to 2 out of 3 among those with a college degree. Overall, nearly half of all young working-age adults lack access to an employer-sponsored pension plan, meaning that they have no work supports for retirement saving. Although a college degree dramatically increases one’s likelihood of landing a job with access to a retirement savings mechanism, a friend astutely noted that it is difficult to maximize (or even begin) one’s contributions to a pension plan if you are stuck paying down college debt you acquired in step one. Even if one makes all the “right” economic decisions based on current knowledge, it is hard to predict the future. The changing nature of work and income volatility, rising costs of living, increasing life expectancy, and concerns about the solvency of Social Security make it difficult for me to imagine what the standard retirement path will look like 20 to 40 years from now—or if there will even be one. As the Baby Boomers retire, or try to, in the coming years, our conception of retirement may change even more profoundly. Although we are facing a period of newfound economic uncertainty, a few things remain clear. With higher employment rates, higher income, and greater access to fringe benefits like health insurance and pension plans, obtaining a college degree remains important for economic success. Of course, it may not be worth the purchase price, and the ballooning costs of higher education are rightfully under much scrutiny. A college degree is not a panacea, however, and not everyone needs one. One hundred percent college completion would not fix the problem of insufficient jobs with inadequate pay and benefits. Last, the findings about pensions highlight a looming fiscal cliff. Baby Boomers are currently coming to terms with the financial challenges of retirement, and future generations may face an even bleaker economic outlook. Social Security benefits are expected to decline and state and local pension funds are under enormous strain. While workers can save on their own, only half of 25 to 44-year-olds have access to some form of retirement plan through their employer, which leaves the other half to take their own initiative to save. With high unemployment, lower real incomes, and rising college debt burdens, saving is difficult for many young Americans. Developing mechanisms that enable savings are a critical step for the long-term economic security of individuals, their communities, and the nation.